In Cumbria, England, 1967, Barbara, Margaret, Lucille, and Grace invent time travel without thinking of how it would alter their lives and the world. The Psychology of Time Travel is an exciting female-driven, murder mystery. Fifty years after inventing time travel, Barbara receives a notice of a death that will happen on January 6th, 2018. Her granddaughter Ruby agrees to help her grandmother make amends with Margaret in order to gain access to the time travel machines. On January 6th, 2018 Odette, an archaeology student volunteering at a toy museum, finds a dead body that the police aren’t able to identify. Odette becomes overwhelmed by the mysterious death and decides she’ll feel better if she can figure out who the dead woman is. After a strange visit from a younger Grace, Ruby is convinced it is her grandmother Barbara who will die. The narrative tackles a lot of issues like friendship, marriage, betrayal, bullying, sexuality, loss, aging, and mortality. The characters have distinct personalities, desires, fears, strengths and flaws. My favorite characters are Grace and Ruby. The Psychology of Time Travel is one of the most thought-provoking books I’ve ever read. Unique, creative, it questions how time travel would impact mental health, relationships, business, history, and language. The first time I started reading the novel I felt incredibly lost a third of the way in. I went back to the beginning and took notes on the times mentioned at the beginning of each chapter and names of characters (there are a lot) and that helped wrap my mind around the story so I could enjoy myself. The plot feels a little messy at times, but that’s to be expected when characters are traveling through time (and even interacting with themselves). 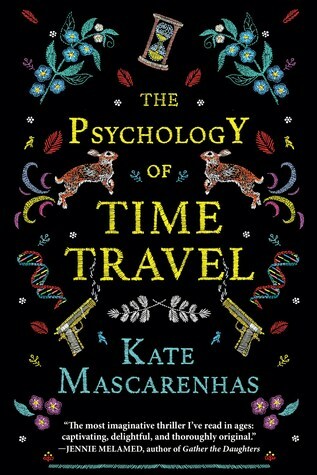 If you liked The 7½ Lives of Evelyn Hardcastle by Stuart Turton or Dark Matter by Blake Crouch then I think you’ll enjoy The Psychology of Time Travel. Some of the concepts are wild, yet when you think about it, they make a lot of sense. Complex, interesting and unique! I recommend this to readers 14-years-old+. Thank you to Sarah at Crooked Lane Books for the complimentary copy in exchange for my honest review. “Kate Mascarenhas is a writer. Hello! We are on this blog tour together and it’s been fun to read everyone’s reviews. I like your comparison to The 7 1/2 Deaths of Evelyn Hardcastle, I never thought of it that way. Great review! Thanks! Blog Tours are super fun, I love reading reviews. Have you read 7 1/2 DoEH? It’s one of my fav mysteries this year. Hi. We’re on the same blog tour. I really enjoy reading reviews from other people who recently read the same book. Great feedback. I need to get to 7 1/2! Great review and I agree with your comparison to Dark Matter. That book was another mind-bending read that I really enjoyed. You also have me wanting to pick up a copy of The 7 1/2 Deaths of Evelyn Hardcastle now, lol.